Nothing beats a full stomach and warm bed after going non-stop for almost 36 hours. We’re in Kilkenny, a lovely little town with High Street as its center. Although January finds very few crowds (for us, a perfect scenario), there are locals meandering along the wet streets, sitting with friends eating at their favorite eatery (these are brave souls or those who don’t let the cold deter them) and stools at the counter of every pub in town, filled with older gentlemen with their pint of Guinness in front of them. Don’t forget the football on the screen. That was nightlife in Kilkenny. From our room at Butler’s Court, we see the castle rising high over the roof tops and that’s where we will begin our day. First, breakfast from our little frig of fresh fruit, Irish Soda Bread and Rhubarb yogurt (actually amazing to my surprise). We load our coot coupe with our luggage and we’re off. Our first full day in Ireland, and we have great expectations. 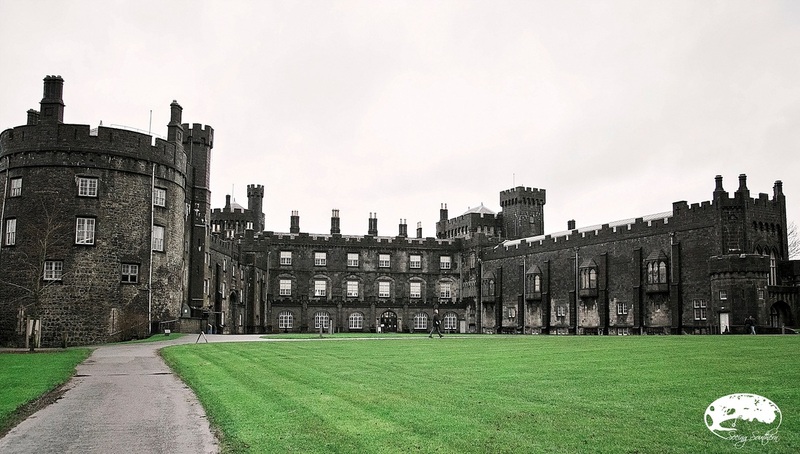 We walk to Kilkenny Castle which has stood for over eight centuries in the heart of downtown Kilkenny. 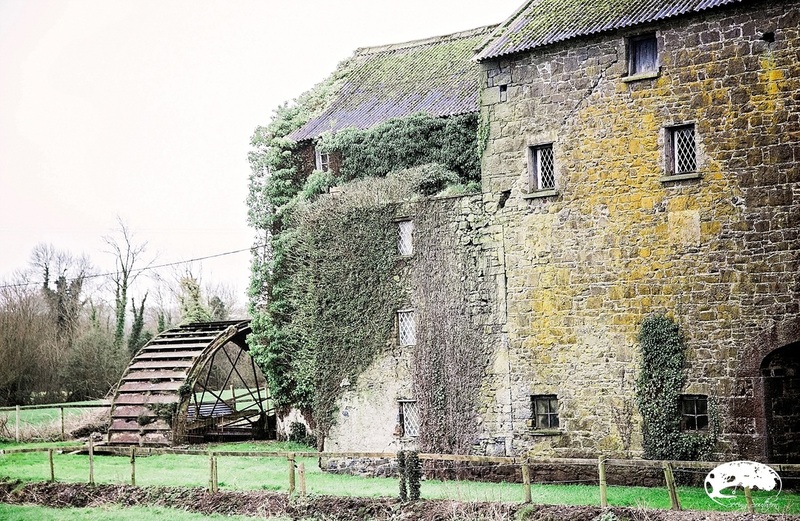 It was built for William Marshal during the first decade of the 13th century and became the principal Irish residence of the powerful Butler family for almost 600 years. Now, it is owned by the Office of Public Works, as we find most castles are where visitors are welcomed. It stands much as it has through various invasions and renovations. A 10-minute film introduces us to its lineage. Hourly guided tours are rather costly, and there’s no photography; we opt to walk the grounds and discover on our own. In Kilkenny, there are many cathedrals, reminding visitors and locals of their timeless and stalwart religious heritage. One of the most beautiful in this medieval city is St. Canice’s Cathedral built in the 6th century and named after St. Canice. Its round tower is the oldest standing structure. On this Sunday morning, as has been the case for the last 800 years, worshipers walk through the doors. There are also modern churches as well as many more that are century’s old welcoming worshipers today. 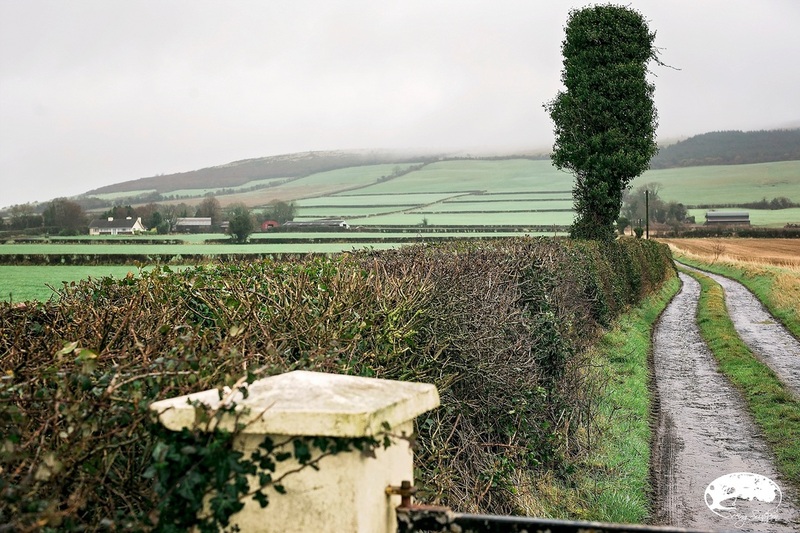 About an hour’s drive west from Kilkenny is Rock of Cashel in County Tipperary. It’s the site of where St. Patrick baptized King Aengus in 450 AD. Strategically placed on the mountaintop for fortification, the Rock was fought over for many years. It was given to the Church in the 1100s. Today, scaffolding covers the outside visage of Cormac’s Chapel which is being restored. In one section of a wall, underneath many layers of plaster, a surprising and exciting discovery: a painting of the suspended Christ with Mary and St. John at his side. The Chapel is the only portion of the Rock that will be refurbished due to the fact that it is one of the last remaining Romanesque chapels in Ireland. We have scheduled each day down to the hour and some of our time estimates have been a little off. Not taking into consideration the awkward driving experience plus darkness, well, it changes everything. There is no substitute for the research we did before we left home. No foreign country should be foreign; it's all about being prepared. However, today we're much later than anticipated, so we begin our journey to where we will spend the night, Kenmare. It’s getting dark and since we’re staying in Maggie and Paddy’s home, we are sure that this might take a little maneuvering. No bright lights of town to lead the way, so we rely on Maggie and our GPS to lead the way. For more than two hours, Maggie’s texts save us. We stop in Kenmare for a quick bite to eat (upon her suggestion), then head toward the Kenmare Bay where an amazing host, a hot fire and a warm bed await. The cottage, built in the late 1800s with walls two feet thick, proves to be a comfort during a night of gale force winds hurling in the bay. The next morning, a farmer’s breakfast – farm fresh eggs, warm yogurt and granola. And of course, tea. What a find on Airbnb, and assuredly, the best lodging we had during our journey. It was like home. 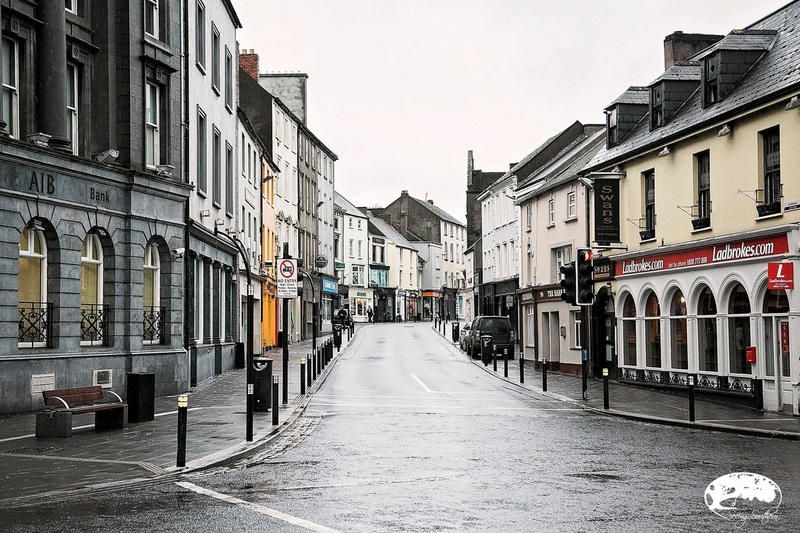 Kilkenny began as early at the 5th century. Named by Conde Nast Traveler as the Friendliest City in Europe, well, we most certainly agree. Truly, one of the best cities we visited. Easy to navigate and truly gracious people. Here's a list of what you can do and see here. Located in the heart of Kilkenny, it stands high above the River Nore, a strategic move. It has stood for over eight centuries. The Classical gateway (below right) was completed before 1710 and features the coat of arms of the Butler/Ormonde family. Christians have been worshiping here since the 6th century, much like they are doing today. It remains a hallowed place, opening its doors to pilgrims and tourists alike. A spectacular group of Medieval buildings set on the limestone mountain of Cashel. It features a 12th century round tower, High Cross and Romanesque Chapel (behind the scaffolding, currently being renovated), 13th century Gothic cathedral, 15th century castle and restored Hall of the Vicars Choral. The original St. Patrick's cross (below left) is housed in the undercroft of the Vicar's Choral. Built in Latin style, it has two pillars running parallel with the main body of the cross. "One face of the monument depicts Christ's crucifixion, while the other shows the image of an abbot or bishop, perhaps representing Patrick himself." It is carved of sandstone. (lower right) St. Matthew and St. John's crest. 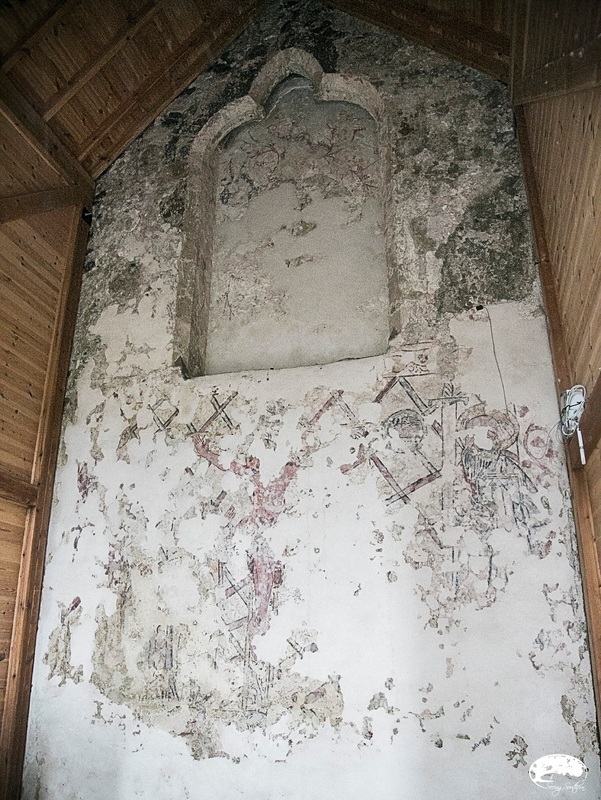 Discovered during the renovation of the chapel is a painting (right) underneath layers and layers of plaster. It is the suspended Christ with Mary and St. John at his side. We had to kiss the stone, and we had no clue that the stone is at the top of the castle. Never let a few curvy, uneven, wet steps deter two coots, so we did just that - we climbed. The castle sits on 60 acres of park lands which are fine-tuned with brooks, flowers and walking trails. It's open all-year-round; admission, 12 euros. A little old man sits (below) on the edge while his photographer waits to the left, positioning those who are watching away from his shot. Lay on your back, trust the old man to hold you and lean . . . and lean . . . and lean back. There's a good two feet between the castle and the stone; all I can see is the grass, hundreds of feet below. Trust and kiss the stone! As the blood rushes to your head, you say, "I've done it." 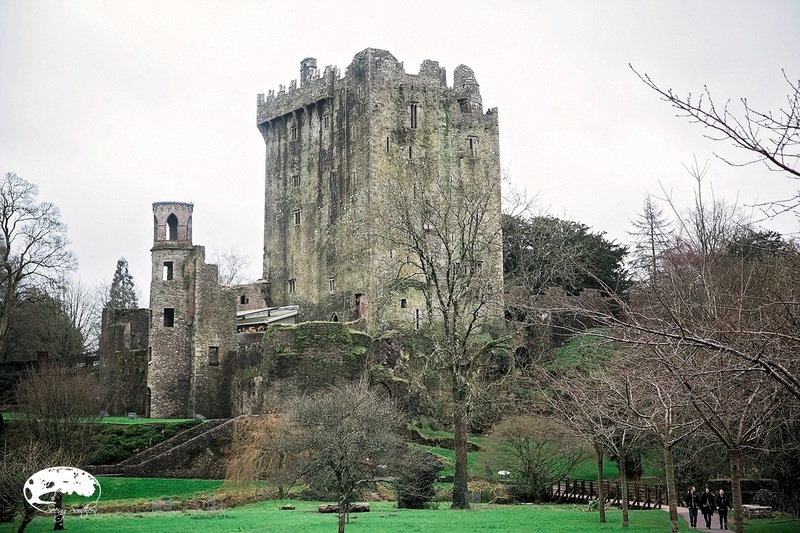 For over 200 years, people have made a pilgrimage to the top to kiss the Blarney Stone and gain the gift of eloquence (the gift of gab). "Some say it was Jacob's pillow, brought to Ireland by the prophet Jeremiah. Legend says it was removed to mainland Scotland, where it served as the prophetic power of royal success, the Stone of Destiny. When Cormac MacCarthy, King of Munster, sent four thousand men to support Robert the Bruce in his defeat of the English at Bannockburn in 1314, the stone was split in half and sent to Blarney. Some years later, a witch saved from drowning revealed it's powers to the MacCarthys." There is a stone there, That whoever kisses, Oh! He never misses to grown eloquent. We'll see . . .
Kenmare in the heart of Kenmare Bay introduces you to the beauty of the Ring of Kerry, a 120 mile loop around the peninsula.